We think this may be a good starting point at which to start getting the feel of this thing and in a few weeks hope to start focusing on where we want to steer this next. Magic Origins is now out and you may have even seen a few new brews or modified builds during the Friday Night Magic Launch. We absolutely love the few short weeks after a new set release as Magic: the Gathering players let imaginations fly with new game strategies. Within a month or so, standard constructed will evolve and many players will simply adopt with what seems to be doing well in the large regional tournaments or what the Pros are playing on the circuit. We've always appreciated gaming with players who ignore the 'status quo' of the established popular decklists. 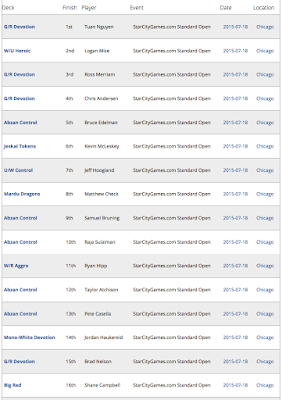 And so, we launch somewhat ironically into an article about the results from the weekend's StarCityGames Standard Open in Chicago. Why? 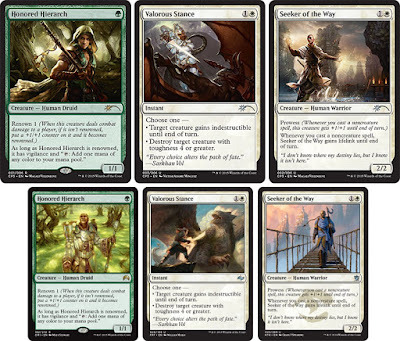 We want to know whether some of our Magic Origins card evaluations were correct - that, and we have a few new lists (examples - U/R Thopters and Bant Enchantments) that are almost complete and want to see how these would fare against the evolving metagame. Anywhoos, here are the Top 16 finalists. Happy Friday indeed as it has now finally come to the much anticipated Magic Origins Release. 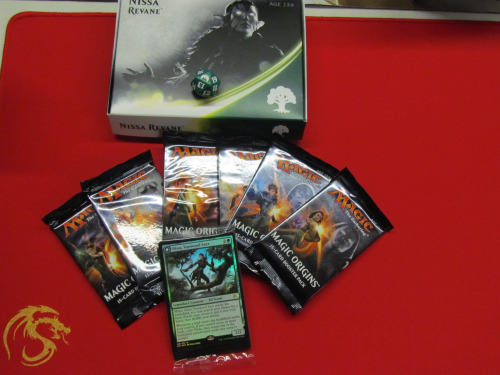 With Magic: the Gathering fans taking part in the PreRelease last weekend, tonight at Friday Night Magic at local gaming stores, players will now launch into a new format, whichever that format may be - standard, modern, commander, etc. Speaking of local gaming stores, our very own OMG! Games, in Barrie Ontario has a fun filled weekend, kicking off of course with FNM tonight, and then a whack of good-stuff on Saturday including a 20% off sale on MTG singles and a preliminary PTQ. 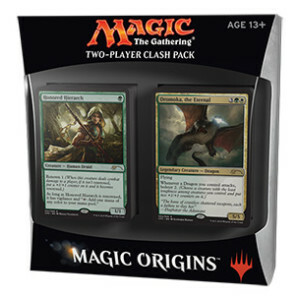 So far this week, we have been touching all our new cards from the Magic Origins PreRelease last weekend and beginning to think upon new and revised decklists for standard format. 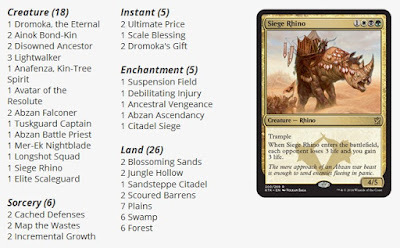 One of the first lists we want to try out at this Friday Night Magic event at our local gaming store, OMG! Games here in Barrie is Blue / Red Thopters, but we'll yatter about that list a bit latter on. Speaking of OMG! Games, they are scheduled to run a Preliminary Pro Tour Qualifier to the first Pro Tour of 2016 this weekend (Saturday 18th July) with a ton of amazing prizes including a 1st prize of $500 cash ($600 credit) and an invite to the Regional Pro Tour Qualifier for the first Pro Tour of 2016. Anywhoos, we should get on with today's article post which should be of great interest to Magic: the Gathering players around the world - this fall's 'Battle for Zendikar' set. 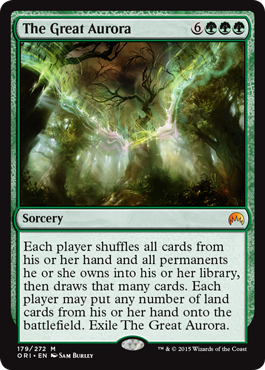 (Sean) Shoutout to all the #mtg players we met at #SDCC2015! We hope you enjoyed yesterday's panel. A recording will be available soon! Yep! 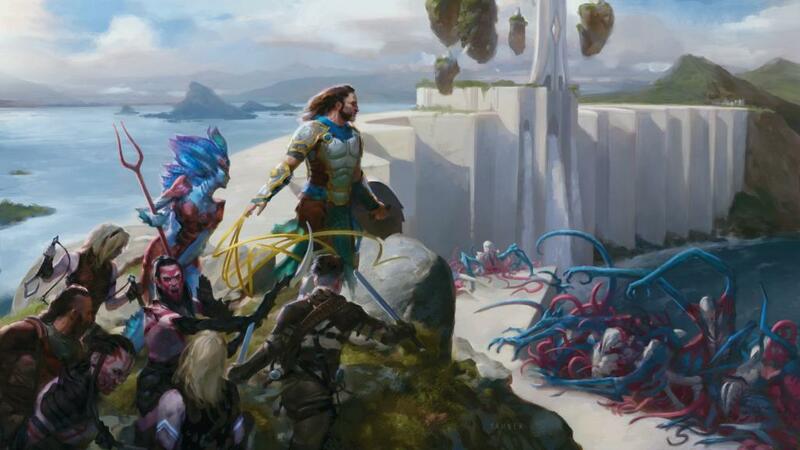 - that looks like Gideon and Kiora (the Crashing Wave) with Thassa's (stolen) bident and a welcome wagon for some Eldrazi. The art here for Ob Nixilis totally rocks. Ob Nixilis is being rather unkind to a Kor here. Zendikar's Halimar inland sea is separated from the natural ocean by a massive sea wall ('sea gate') - you can see the Lighthouse in the background here. Planeswalkers Nissa and Gideon battling Eldrazi brood. Hieromancy - the magic of justice and order. Epic art here showing Nissa going down town with the token 'Ashaya, the Awoken World'. 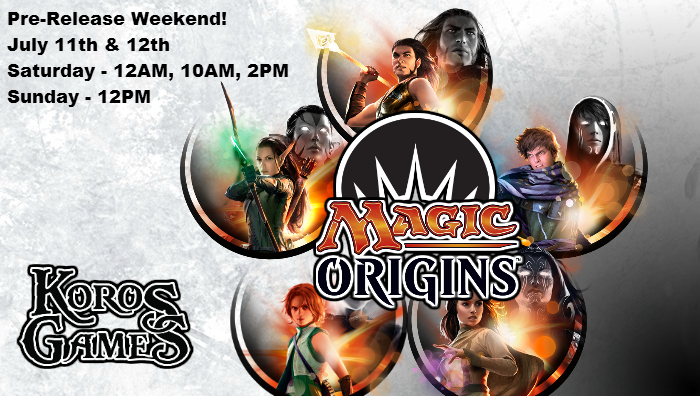 We hope all had a great weekend, whether you were at a Magic Origins PreRelease or attending San Diego Comic Con (SDCC), or even both. 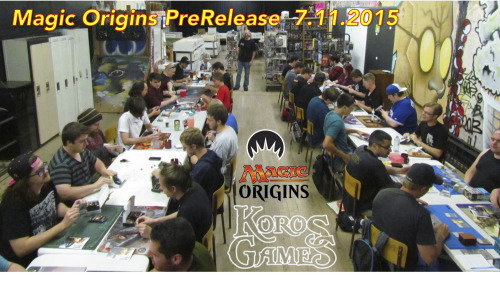 As you may have guessed from us gushing over on our MTG Realm Tumblr stream, we took in a midnight Magic Origins PreRelese event over at Koros Games in Orangeville, Ontario and had a blast. 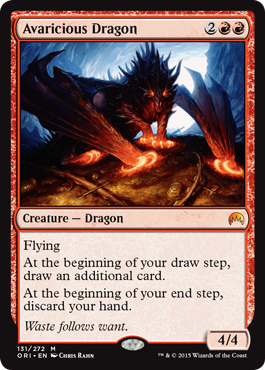 Here's a bit of the PreRelease before we get into some of the big Magic: the Gathering news out of SDCC. 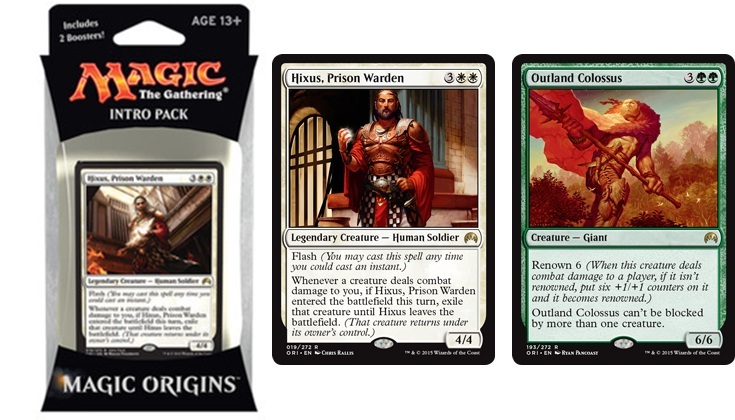 The first PreRelease Pack colours to go were white, red, and black, pretty much in that order. 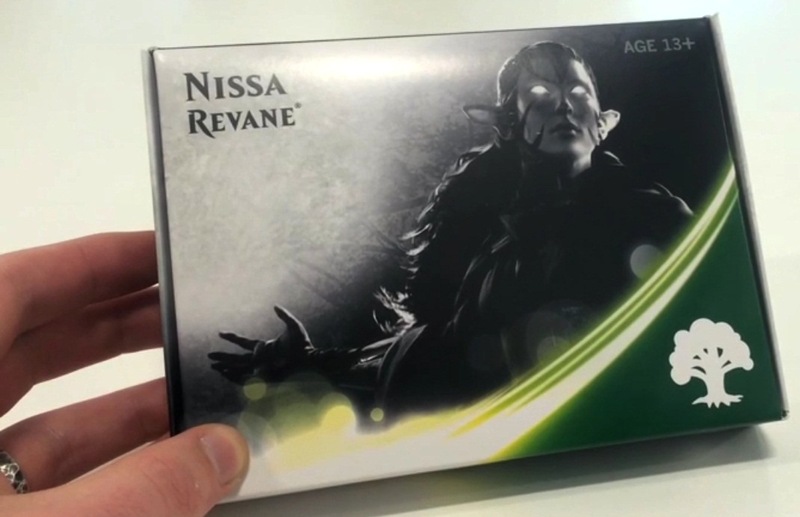 We saddled up with a green pack and when popped, we could not be more happier - a foil Nissa promo - shown on our lucky BCW Supplies Playmat. Our most valuable players were Rhox Maulers, especially when paired with with pump spells such as Titanic Growth and Might Leap. Since we got up really, really early for work Friday morning, we simply ran out of steam by the end of the second match and retired for the evening. The Wizards of the Coast Panel at SDCC 2015 was not streamed unfortunately but there were a number of 'live tweet' from the Wizards MTG Twitter account. There was also a promise that there would be a recording available soon. 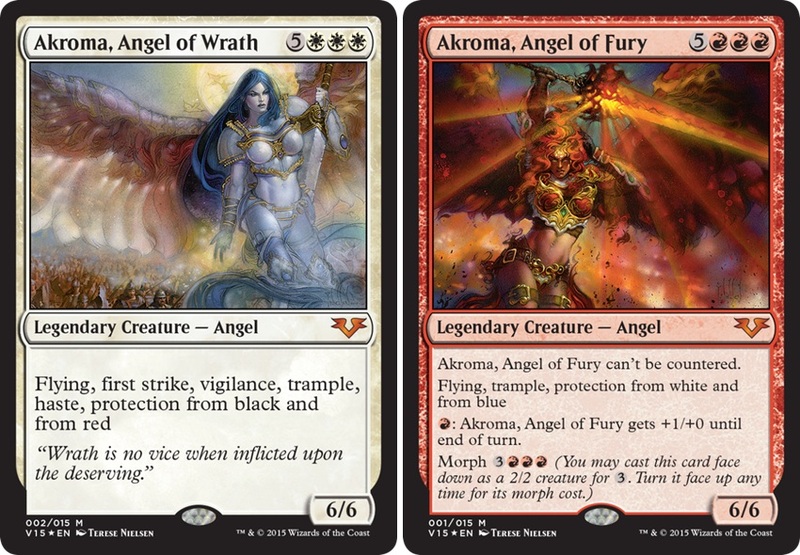 First up, the Panel had two previews for the upcoming From the Vault : Angels during the panel at SDCC - say hello to the Akroma sisters ! 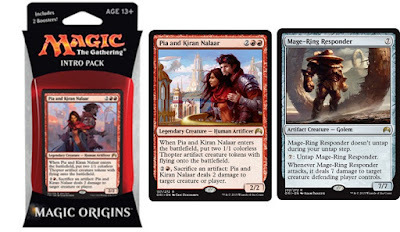 There was also a good measure of discussion on how WotC now presents storylines with references to the recent installments of the Magic Origins stories provided on the Uncharted Realms column. There were also some very exciting images previewed for the next set, Battle for Zendikar, to be released early October 2015. From the Q & A portion of the panel (and MaRo's Blogatog followup), we also learn that we may expect 'Allies' to return to the revisitation to Zendikar. Pop back to MTG Realm tomorrow as we further discuss Battle for Zendikar. In less than twelve hours, we will be at the midnight PreRelease event for Magic Origins at Koros Games in Orangeville, Ontario which is about an hour and change north of Toronto. You may recall an article we had posted last year about this very cool store and great gaming community. If you are in the neighbourhood, drop by Koros Games and say hi. 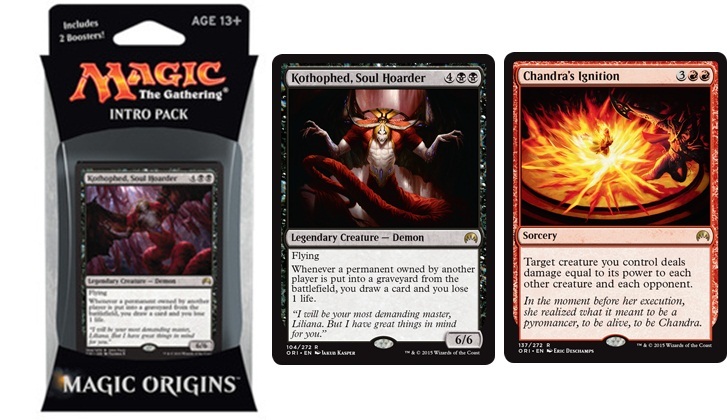 A throng of Magic: the Gathering fans will be the first to get their paws on new cards and game until the early light. MTG Realm will have a full report on the prerelease tournament with video, pics and a write-up as to how this set plays in sealed format. 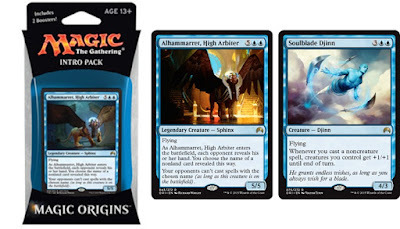 Anywhoos, we have to get on to today's articles - Magic Origins Intro Packs.
. . . And here are the lists ! The Clash Pack comes with instructions that show how to combine cards from each of its decks to create a new deck designed to be equal in power to what is expected from an Event Deck. 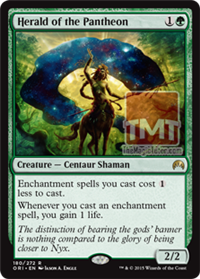 This particular product is designed to prepare players for Friday Night Magic and Standard format tournaments. We love the excellent alternate art cards WotC had commissioned. Having an alternate art for Siege Rhino which is seeing popular play currently in standard format has our attention. Having a valuable rare like Collected Company has now made it a no-brain decision to pick up this Clash Pack. We can't wait to have these two lists battle eachother, and will likely swap the alternate arts with regular in order to pimp out our various Commander and Tiny Leader builds. Here in Central Ontario, we are now experiencing the first proper heatwave of summer. 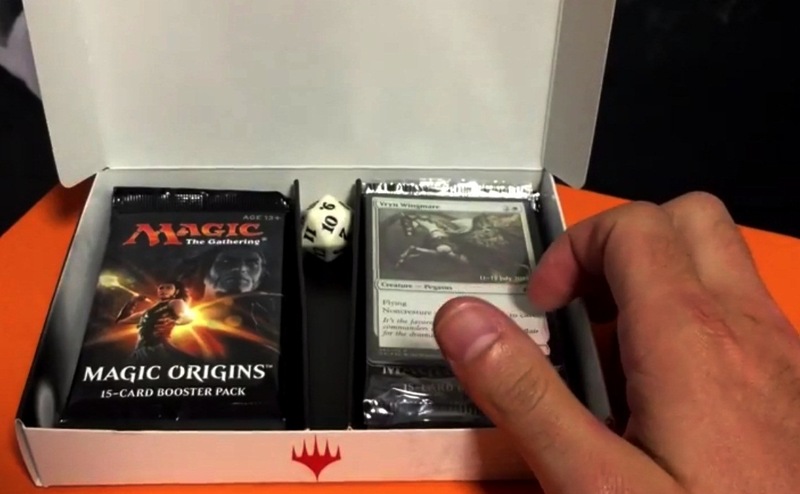 For Magic: the Gathering players worldwide, things are also heating up as everyone is now looking to this weekend's Magic Origins PreRelease event. 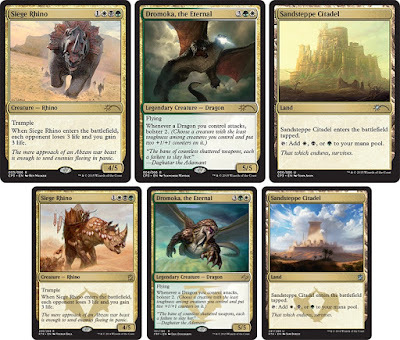 Like most, here at MTG Realm, we are reviewing all the new cards after last Thursday's full reveal and are now evaluating the cards that would make for a strong sealed event. As is tradition, we'll be off to our local gaming store, OMG! Games and hope to report a Top 8 success. To find a Magic Origins event near you, pop on over to the 'Locator'. 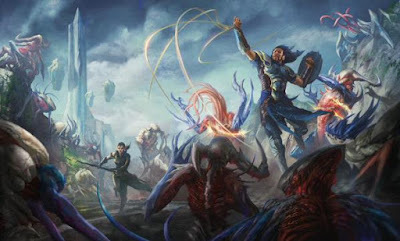 We would highly recommend reading WotC staffer Gavin Verhey's article today (linky over here) on the mothersite to make the most of your PreRelease event. For today's article, we want to confirm with you what to expect in the Magic Origins PreRelease Pack. Magic Origins prerelease packs give players the opportunity to learn the origin of their favorite Planeswalker. There are five prerelease packs, one for each planeswalker's color - White (Gideon), Blue (Jace), Black (Liliana), Red (Chandra), and Green (Nissa). 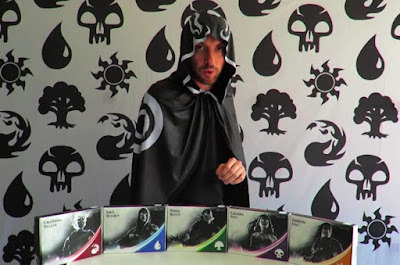 The pack's theme does not guarantee a specific Planeswalker card (obviously). 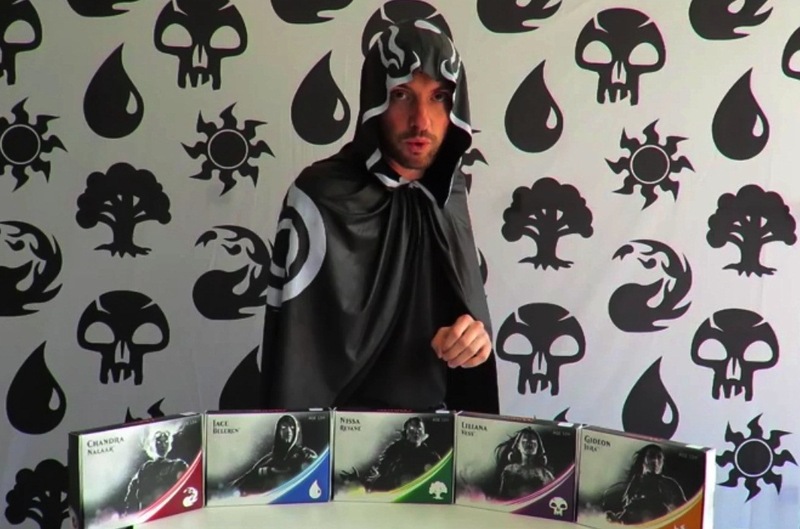 Each comes with a 7-card seeded booster pack that corresponds with that color. 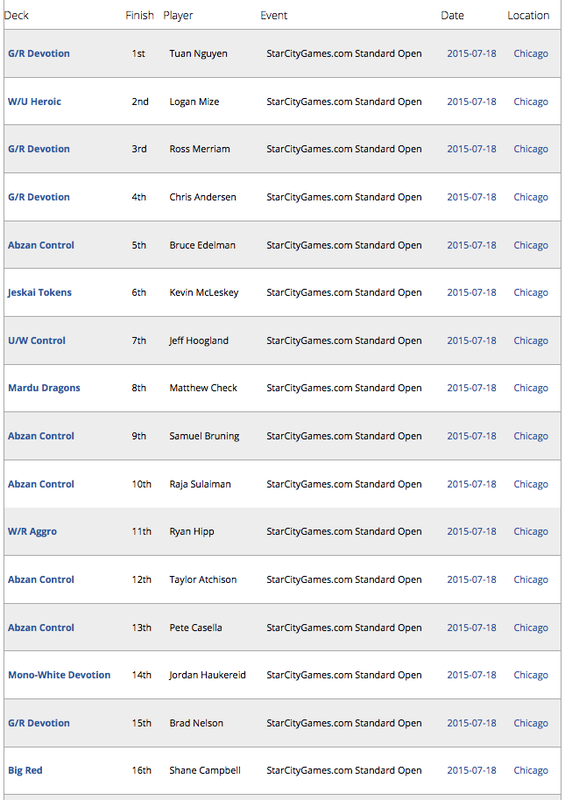 When registering for the Prerelease tournament, each player chooses one. 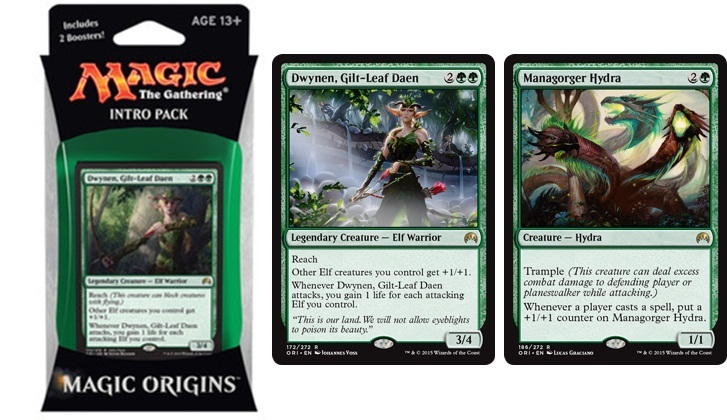 The seeded booster pack will assist players in building a deck by providing a starting point in their chosen color. Each seeded booster pack contains a stamped premium promo card, which players may include in their tournament decks. The prerelease pack further contains 6 regular booster packs, 1 story booklet and 1 Spindown life counter. A big w00t to all our American cousins to the south who are celebrating Independence Day this weekend. 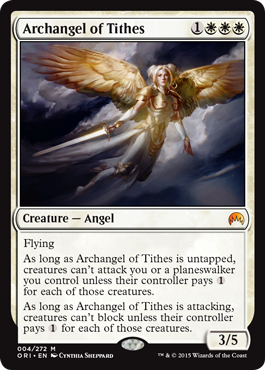 Magic: the Gathering players are also celebrating the full revelation of all Magic Origins cards today over on the card image gallery on the mothersite. We are off to OMG! Games, here in Barrie, Ontario later tonight and will most definitely be tattering about the last two rates revealed including the remainder of the cards. Here's the two and the full list below. Mothersite preview - fine piece of player hex proof. Motthersite preview. 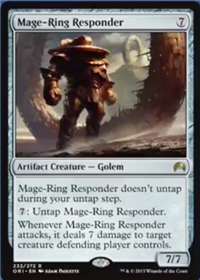 Damn fine mana acceleration tech here. We hope all fellow Canadians among our followers have had a pleasant Canada Day yesterday and to our American cousins to the south, we wish a safe 'n' happy Independence Day weekend. Akroan Sergeant - ? red human soldier, first strike, renown 1. Ampryn Tactician - white 3/3 human soldier, +1/+1 your creatures eotb. 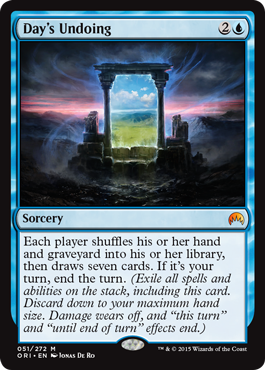 Anchor to the Æther - blue sorcery target creature library top, scry 1. Bone to Ash - blue creature counter, draw card. Calculated Dismissal - blue counter unless 3, spell mastery. Call of the Full Moon - red aura +3/+2, nerf if opp cast 2+ spells. 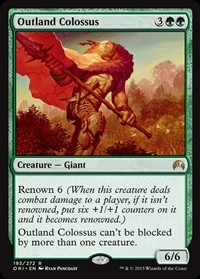 Consul's Lieutenant - white human soldier, first strike, renown 1, conditional +1/+1 pump to attacking creatures. Guardian Automaton - 3/3 construct, 3 life when dead. Knightly Valor - white aura +2/+2 vigilance with 2/2 knight token. Kytheon's Tactics - white sorcery creatures +2/+1, spell mastery. Screeching Skaab - blue zombie, self mill 2. Sigil of Valor - equipment +1/+1 if swinging alone. Sigiled Starfish - 0/3 tap to scry 1. Suppression Bonds - white aura threat shutdown. Totem-Guide Hartebeest - antelope enchantment tutor. LoadingReadyRun preview - All Hail the DurdleBot !! Big, bulky, akward like that introvert linebacker. 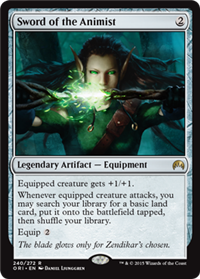 You could use a recursion tech like Whip of Erebos or perhaps an un-tapper like Kiora's Follower to reset but we don't think this would pass muster for most. 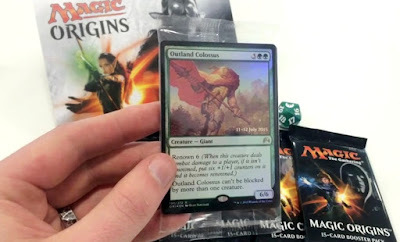 Chinese MTG Facebook preview. 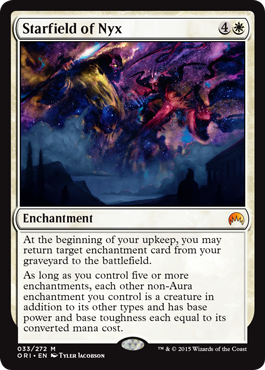 We loved this card in Conflux and hope to make the most of the enchantments in Magic Origins and of course with Theros block before rotation, perhaps even floating a constellation build that actually may not be rubbish. 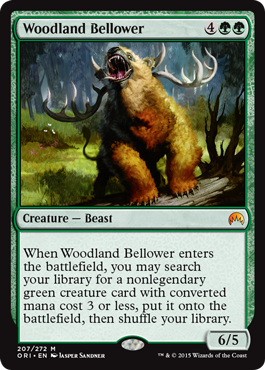 Whenever a creature an opponent controls becomes the target of a spell or ability you control, gain control of that creature for as long as you control Willbreaker. "Master your mind, or I shall master it for you." Mothersite preview. Rather interesting and potentially powerful should you fire off a spell targeting multiple creatures like Curse of the Swine or an Icy Blast. 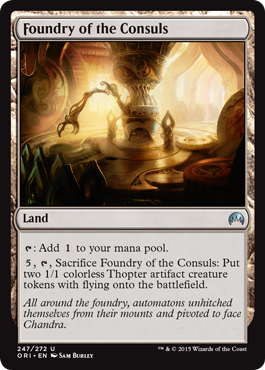 • Foundry of the Consuls - Uncommon Land tapping for a colorless or paying five, sac and giving two thopters. • Celestial Flare - good white combat trick. 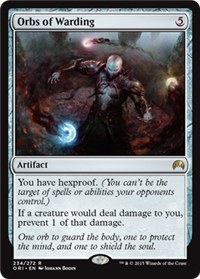 • Negate - blue counter staple. • Nantuko Husk - everyone's fav zombie insect. • Might of the Masses - solid green pump. Joyeux Fête du Canada. The British North American act of 1867 created an environment in which Magic: the Gathering could be played freely within the Dominion of Canada. 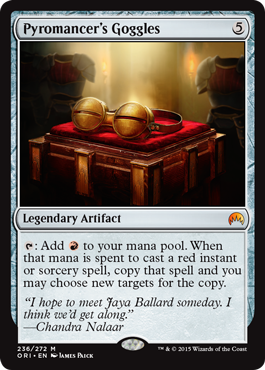 Anywhoos, enough of that nonsense - everything is closed up our way so we are most definitely on top of Magic Origins spoilers and previews as the internet never takes a day off. Here are today's cardboard awesomeness. A whole bunch of new Magic Origins cards via Spell Slingers (video belwo) - Anointer of Champions, Auramancer, Blightcaster, Blood-Cursed Knight, Fleshbag Marauder, Magmatic Insight, Reclusive Artificer , Skysnare Spider, Somberwald Alpha, Stalwart Aven, Tragic Arrogance, and Zendikar's Roil. 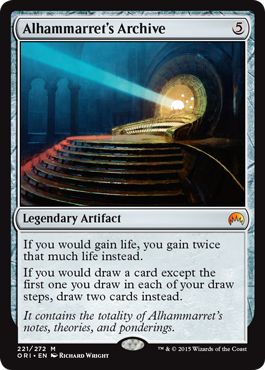 For each player, you choose from among the permanents that player controls an artifact, a creature, an enchantment, and a planeswalker. 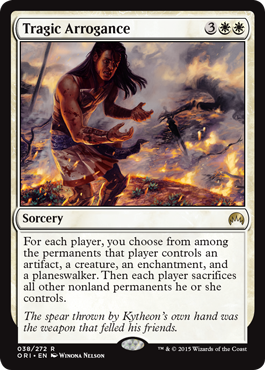 Then each player sacrifices all other non land permanents he or she controls. Mothersite preview. Five mana for a one-sided board reset is a fair price in our books. Love this card. 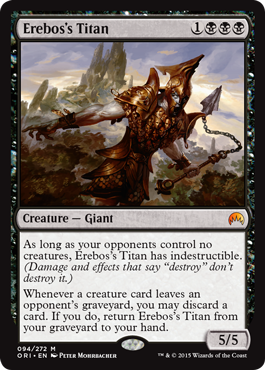 Erebos's Titan has indestructible as long as no opponent controls a creature. Whenever a creature leaves an opponent's graveyard, you may discard a card. If you do, return Erebos's Titan from your graveyard to your hand. 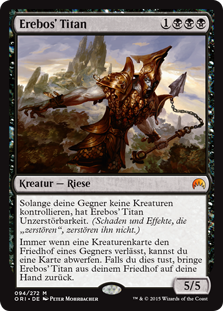 MagicBlogs.De German preview. Perhaps it is the lack of caffeine but we think there may be only a very finite number of decklists which this may be appropriate in. Magic Show preview. 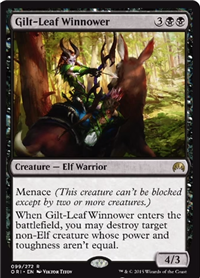 Nice stats on this card and menace is sweet - go green / black elves! Encahntment spells you cast cost 1 less to cast. The Magic Tutor preview. Love it! 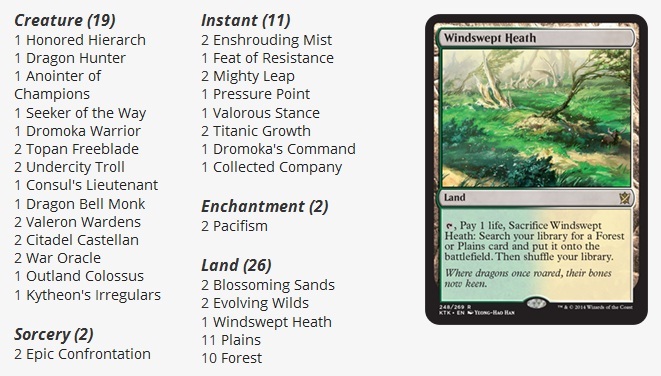 Green / white enchantress lists are very near and dear to our heart. MTG Japan preview. Pretty sweet late game card with a decidedly powerful effect which could swing a game your way. MaRo Twitter preview. Ahoy green fatty that promises to go nuclear if it lands a hit.